Let’s start with a question: Do you know what acetal plastic is? If you don’t, and you’re a member of the DIY community interested in using plastics you’re probably missing out on this readily available plastic with excellent properties. Acetal shot to fame in the 1990s in the paintball gun (called “marker”) aftermarket modification community. Acetal offers a plastic with the closest properties to metal: when you hold an acetal part it *feels* different than most plastics. Admittedly, most plastics feel and look the same…Soft and waxy. However, acetal is heavy and dense, it has a weight to it that makes it feel more like metal and that is where this material really shines: replacing metal. In paintball markers acetal was a no-brainer. Like metals, and better than all other plastics, acetal is beautiful to machine and excels in replacing metals for small, precision parts. As a plastic, it does not suffer the same corrosion issues metals do and yet is still lighter. This allowed the markers to shoot better and faster. Outside of paintball, acetal works great as a bushing replacing nylon. It handles the same PSI in application (4000) but does not suffer the moisture absorption issues nylon does. 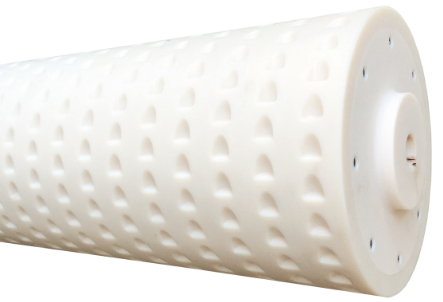 As such, acetal is often used as a direct replacement for cast nylon in “wet” applications. Acetal comes in two forms, the homopolymer (white) and copolymer (black). There used to be quality issues with the white but those have been remedied. Though the materials have some small differences, they probably would not affect any DIY application, so pick whichever is more available from your local distributor. Besides being available in rod acetal is also available in plate with 24″ x 48″ plate being the most common. For more information on Redco acetal please click here. Nylon is a fairly popular plastic used by the DIY community: and it should be! Versatile, strong, and available in small quantities it offers many properties valuable to the public’s plastic applications. In most cases, nylon will be an ideal material for mechanical parts such as sheaves or bushings. But it isn’t perfect and it like anything it has its drawbacks in certain applications. Here are some tips on using nylon that will serve you well. Unlike most plastics, nylon absorbs a significant amount of water – up to 4% of its volume in 24 hour saturation. For marine applications or those involving tight tolerances you probably want to go with an alternative material. Acetal is commonly specified in this case but Tuffkast may be an option as well, it depends on the application, so ask your distributor. Nylon can handle 4000 PSI in application and this is one of the highest loads of readily available thermoplastics. This makes nylon excellent as a bearing, sheave, or other load bearing part. Nylon isn’t just “nylon”. It’s available with a variety of fillers: glass for dimensional stability, moly for high load low RPM applications, oil filled for reduced friction, UV stabilizers for outdoor use, and PVM (pressure velocity maximum) for the highest load applications. These fillers add only a minor cost, or in some cases cost the same as the natural grade, and are well worth it for certain applications. Unsure if you need a filler? Discuss your application with your distributor. Even though three of these four tips are “don’ts” knowing when to avoid a material is just as important as knowing when to use it! Don’t get us wrong – nylon is a versatile, excellent, affordable plastic for a wide range of applications. Just keep in mind that it has advantages and drawbacks: just like every other material out there. There are a lot of flashy “do it yourself” projects that hobbyists get in to with plastic but one application that keeps coming up that you might not think of is the simple gear. The general reasoning to use a plastic gear as a replacement for a metal gear make intuitive sense: the plastic gear will often be mated to a metal component and the fact that you have a plastic on metal connection now should greatly increase the life of the mating components. The problem is hobbyists do not really know what to use: we’ve heard of HDPE, UHMW, nylon and even polyurethane be requested by the DIY community for a home made gear application. But how suitable are these plastics for the application? Actually – not very. Most plastics cannot be machined to tolerances as tight as metal be but many plastics, especially the polyolefins such as HDPE and UHMW, are very soft and could have the gear teeth quickly lose their shape once that gear starts working. Nylon is better, but it cannot take much impact at all – especially in the cold – meaning it is considered to be fragile. The best material for the application is actually acetal. Acetal is a very hard plastic that machines very well and holds excellent tolerances. It is widely available in rod stock from plastics distributors across North America. 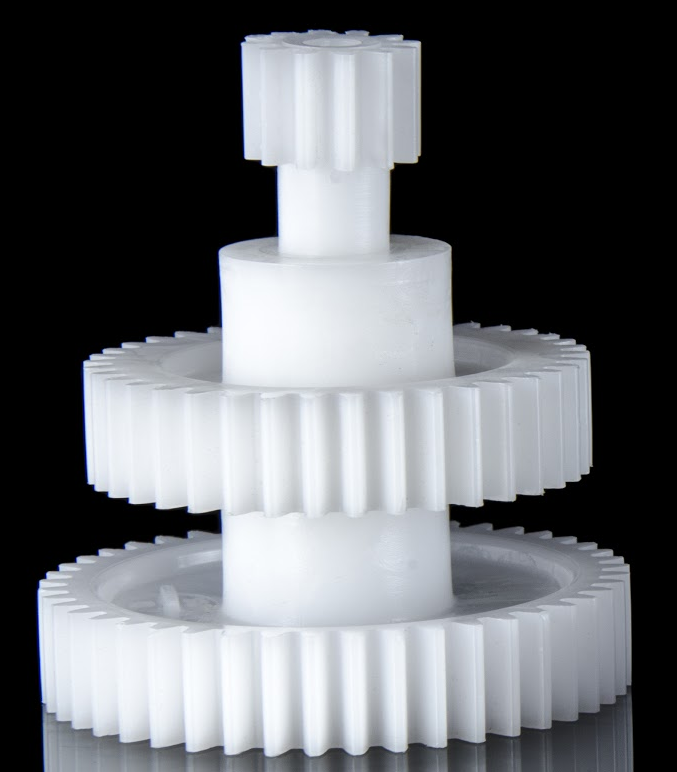 The gear in the picture below is made of white, homopolymer acetal. Black copolymer acetal is also widely available and would work well too – its properties are slightly worse than homopolymer in some respects but it is also less expensive. For many people who celebrate the holidays, Christmas decorating is one of the most enjoyable parts of the season. While “engineering plastics” and “decorating” are not so commonly put together, people have found some remarkable ways of using polymer products to do some creative work! We’ve found a few highlights. First on the list is the “Winter White Village” found on Pinterest. 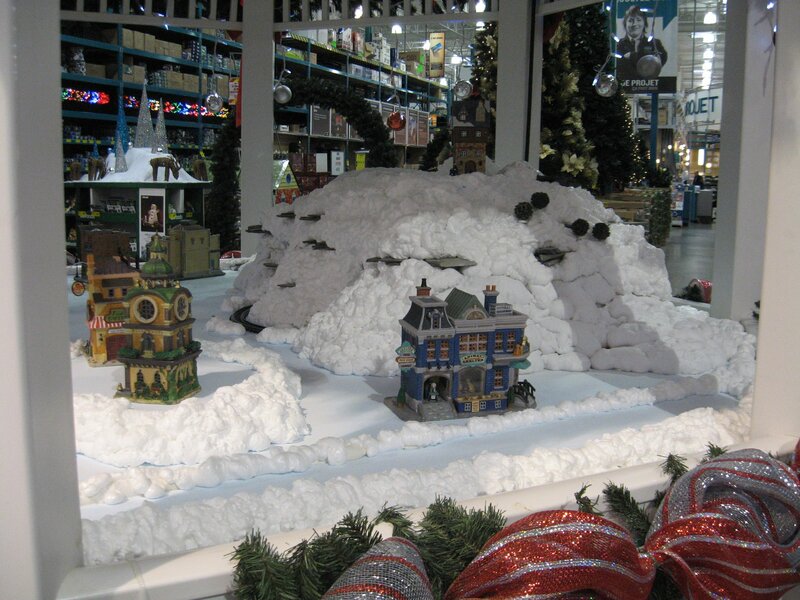 The idea is to use Touch ‘N Spray polyurethane white foam to create snowbanks as a backdrop for some holiday themed buildings. Simple, and it works. This is the picture used in this blog (found below) and the pin can be found here. Secondly is the “UHMW skating rink”. We’ve blogged about this in years past, white UHMW polyethylene makes an excellent skating rink surface! It’s very slick and strong and can actually improve your skating ability on real ice as skating on UHMW requires about 20-30% more effort with your stride. In this case we don’t have a particular website for you: most of the good pictures are on commercial websites where if you try to click on them they want you to sign up for their service. You can still see some good pictures of this application by simply going to Google, click on the “images” tab and then searching for “UHMW skating rink.” UHMW sheet in 4′ x 10′ dimensions is readily available from North American plastic distributors. You just need to be ready for the pricing which can range from $300-$500 per sheet depending on what thickness you go with: 3/8″ or 1/2″ are the most common. Thirdly, acetal Christmas-themed guitar picks would make a great stocking stuffer! Acetal, which is a very hard and rigid plastic that often replaces small metal parts, makes an excellent guitar pick. These holiday themed picks would go great with caroling and while websites do sell the finished picks, there’s no reason you could not buy a plain white pick, get some vinyl stickers and do your own designs! To check out some available designs click here. And finally, what would the holidays be without a Christmas Tree? Trees made of recycled drinking bottles are becoming more commonplace. We think it’s a great idea to educate people, children especially, on the need to recycle. Plastics are easily – and economically – recycled after all! Many pictures and examples of these trees are available as inspiration to you. Maybe do one this year to educate your own family on the benefits of recycling? You can find an excellent example of such a tree by French artist Fabrice Peltier here. We hope this examples inspire you to see how you can use plastics in your Christmas season celebration! You know what they say about simple ideas – sometimes they’re the best! We found a video of a DIY project where a CNC machine is used to etch a ball maze into a piece of acetal plastic (of which the name of the homopolymer variety is ‘Delrin’). Apparently the project was for students who designed the game from an initial paper sketch all the way through the CAD program. This project is simple enough for students yet creates a functional and fun piece of work. In short, it seems like genius. Acetal is a great plastic for machining, probably the best thermoplastic in holding tight tolerances. Acetal has numerous other “Do-It-Yourselfer” applications. Most common is probably aftermarket paintball equipment, which we have blogged about previously here. Acetal replaces small, precise metal parts and often replaces polyamide (nylon) in applications where moisture is a concern. Punch Your Own Acetal Guitar Picks! 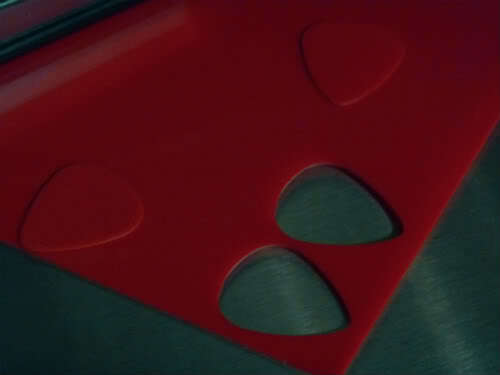 One everyday application that uses performance industrial plastic is guitar picks. The rigors of many thousands of abrasive strokes against guitar strings means quality plastic is ideally suited to this application. ULTEM (semi-transparent amber or black color) is sometimes used but acetal (opaque white or black) is more common. Black nylon is also a good plastic for this application but is less well known. We recently found a website all about a do-it-yourself product called the “Pick Punch” this lets you take acetal and punch your own picks at home – you might never run out again! This is much more economical (and fun) than simply buying picks, wouldn’t you say?